If you’re using a cleanser that is unsuitable for you skin, it’s all too easy to fall into the trap of thinking that your skin is clean, whilst in reality this couldn’t be further from the truth! In order to keep your clean looking as fresh and clear as possible, it’s important to take your time and choose a cleanser that is not only designed for your skin type, but that is also suitable for your lifestyle. For example, if you tend to wear a lot of make-up on a daily basis, or work in a dusty or dirty environment, a simple gentle cleanser might not be enough to give your pores the thorough cleanse that they so badly need. If spots and blemishes have started to appear, and you feel that it may be because your cleanser is letting you down, it’s simple to get your skin squeaky clean and feeling really refreshed. Firstly, Dermalogica Precleanse will get cleansing well under way, and will penetrate deep into the pores for the ultimate deep clean. Next, you need to assess your skin type and choose a cleanser accordingly. 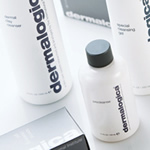 Again, Dermalogica have an unbeatable range, so whether your skin is dry, oily or combination– there’s a product to suit. Dermalogica Dermal Clay Cleanser is perfect for shifting stubborn dirt and oil, and will make your skin feel truly amazing and is ideal if you have excessively oily skin. Cleanse your skin the right way, and experience the feeling of fresh skin like never before!